Why Are Black Children So Much More Likely To Die Of Asthma? : Shots - Health News Most genetic studies look only at people of European descent. But black and Hispanic children are far more likely to die of asthma, and genetic differences may help explain why. 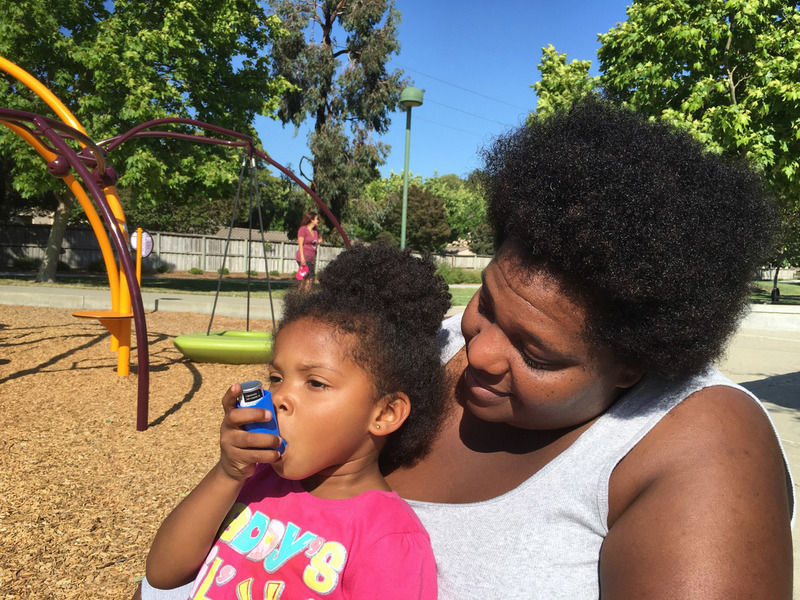 Zunika Crenshaw helps her 3-year-old daughter Jhase Crenshaw Bass with an asthma inhaler. Zunika Crenshaw cringes as a tire swing whips her children around in circles just a little too fast. It's a sunny afternoon in the park, in Pleasanton, Calif. As her children play, she keeps a close watch on their breathing. She says asthma is in her genes. "You have a family, a person who has four kids, and all of them have it, including me," she says. "And then my mom has it, and my sister's two kids." A little girl, 3-year-old Jhase, runs over to her, wheezing. Crenshaw grabs an inhaler, and her daughter breathes deeply from it. "Perfect!" says Jhase. She lays her head against her mother's chest, then runs back to her brothers. Crenshaw drops the inhaler in a pile of medications in her purse. She points to various pill bottles. "Zyrtec, and this is ClariSpray. And there's albuterol and Dulera." There are more drugs at home. Asthma is the leading chronic disease among children, but it hits some populations harder than others. According to the federal Centers for Disease Control and Prevention, black children are twice as likely to have asthma as white children. And black children are 10 times more likely than white kids to die of complications from asthma. A team of scientists at the University of California, San Francisco, is on a mission to understand why. The researchers are digging into genetic clues that may have been overlooked until now. Geneticist Marquitta White just published a study finding that the majority of genetic information scientists have on asthma patients doesn't apply to African-Americans. "The majority of genetic studies, not just in asthma but in most diseases, are done in Caucasian- or European-descent populations," White explains. "The longest studies do not really include very many minority populations, which means that most patients aren't getting the best care, because we don't really know what the disease etiology is in their particular population." Medications also work differently in different populations, according to Esteban Buchard, a pulmonologist at UCSF. As an example, he points to the small print on the instructions for a common asthma medication called Advair. "It specifically says that if you're African-American and you take this, you have an eightfold risk of dying," he says. 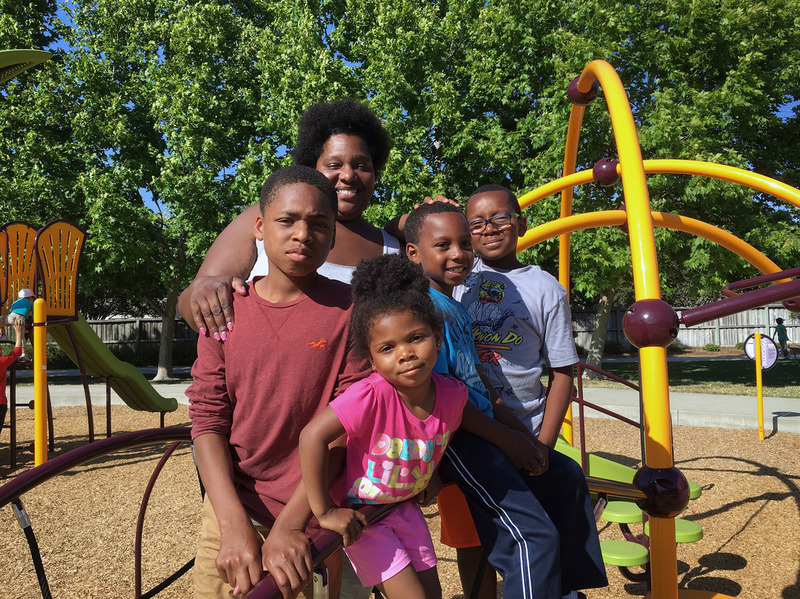 Zunika Crenshaw packs her purse full of asthma and allergy medications for her children when they go to the park near their house in Pleasanton, Calif. The UCSF team is analyzing the genes of black, Mexican-American, and Puerto Rican children to better understand drug responses in each population. 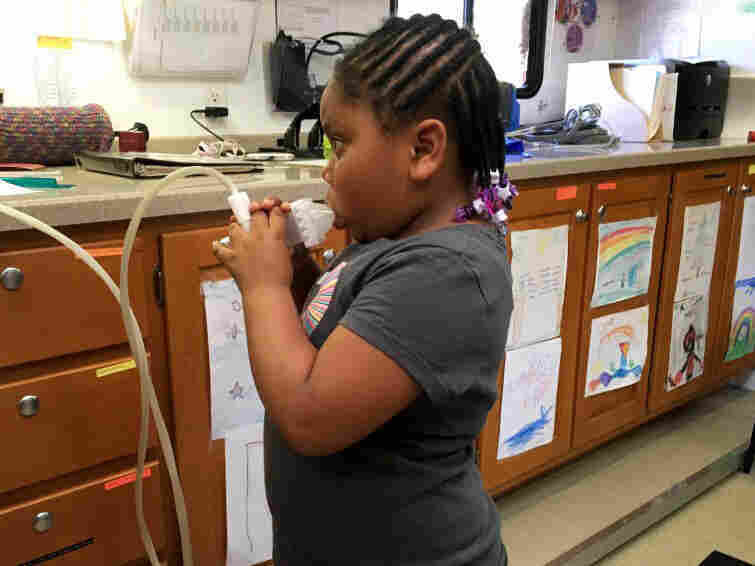 "One of our hypotheses is that what's underlying this huge mortality in African-American children is the fact that the most commonly prescribed drug for asthma is albuterol," says White. "The problem is that not everyone responds to albuterol the same way. And actually, Puerto Rican and African-American children have the worst drug response. So you're looking at two populations with the worst drug response with the highest mortality. We have a feeling those things might be related." Good treatment is key to preventing the kinds of serious asthma attacks that keep kids home sick. The Crenshaw children are missing fewer school days since they started visiting the Breathmobile, a long motor home converted into an asthma clinic. The clinic is run by a nonprofit called the Prescott-Joseph Center. It travels throughout the East Bay offering free treatment to low-income families. Inside, a medical assistant tests the lungs of a 5-year-old girl who's fiddling with her tight braids. The clinician pauses several times so the girl can blow her nose. A lung test on the Breathmobile finds that 5-year-old Brooklyn Turner's pulmonary function is compromised by her asthma. Pat Granberg, a pediatrician, asks the girl's mother about their living conditions, their neighborhood and their financial situation, to determine likely triggers for asthma. The disease can be caused by a number of factors, including obesity, air pollution, access to health care, molds, mildews, pets, perfumes and smoking. But Granberg begins an assessment by asking whether asthma runs in the family, because there's usually a genetic link. "On average, 60 percent of what's going to determine whether or not you have asthma is going to be due to genetic factors," says White. She says depending on the population, that number could range from 35 to 90 percent. "I think that what we should be striving for is equal care for everyone," says White, "and in order to do that you have to know what the disease is doing in everyone. That's step one." Buchard believes a lot of health disparities could be explained if more minorities were included in genetic research. To illustrate his point, he looks back to when researchers studied heart disease only in men. "Women present differently than men do for heart attacks," says Buchard. "So a whole generation of physicians were misclassifying and misdiagnosing women simply because women were not involved in the original clinical trials." In 1993, Congress passed legislation requiring that publicly funded medical studies include more minorities. But a 2015 review of lung disease studies found only 5 percent of publicly funded research included patients of color. This story originally appeared on KQED's blog Future of You.